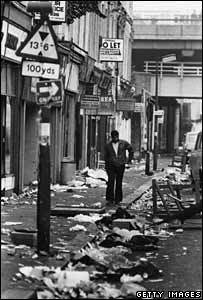 This year marks 30 years since the Notting Hill Carnival riot in 1976 - an important year for race relations and one which saw carnival hit the headlines - albeit for the wrong reasons. This raised the tension, but what sparked the riot is still open to question. White fascist gangs were said to be at large. Police said it began after attempts to arrest a pickpocket. BBC London radio presenter Dotun Adebayo was 16 at the time and remembers dancing to calypso music on Portobello Road when the trouble started. He said: "Within seconds the whole place erupted and I realized I was in the middle of a serious disturbance. "I had never seen policemen running away from a situation before. "I don't know where all the rocks came from but they were raining down on the fleeing cops. Questions were later raised about whether carnival should continue. Professor Chris Mullard, chairman of organisers London Notting Hill Carnival Ltd, said: "It became very difficult. "Carnival was always seen by the state and the establishment as something that they wanted to stop, because they saw it for what it was - a form of cultural resistance." He said it became a "running battle" between organisers and the "establishment". But there was a determination to see it continue, and carnivalists started to form alliances with sympathetic groups - like trade unions. He sees the riot as important in the history of race relations, giving rise as it did to the implementation of the Race Relations Act 1976 which prohibited racial discrimination. As carnival changed, so did the social make-up of Notting Hill as the 1970s and 80s saw the area "gentrified", with wealthy residents moving in - many of whom are still no fans of carnival. But relations with the police have greatly improved, although is still heavily patrolled by officers who prepare all year round for it. Prof Mullard said commissioner Sir Ian Blair and his predecessors have all been positive about the event. Ch Insp Rod Charles, who was a beat bobby in Notting Hill in the 1980s and is still involved in the operation, said things had changed a lot since 1976. "Carnival has grown exponentially," he said. "We have got a number of people travelling from different parts of the world and the UK. "Things are certainly, in our opinion, going very well in terms of police and community relations." For Mr Adebayo, the event is now one of the most peaceful of its size in the world. "I saw a lot of terrified faces in 1976 and 1977. Faces of young kids and parents who didn't know where to turn to safety. I hope I never see that again," he said. "But we shouldn't forget 1976 and its impact on this country before Lord Scarman picked up the pieces of the Brixton riots years later."